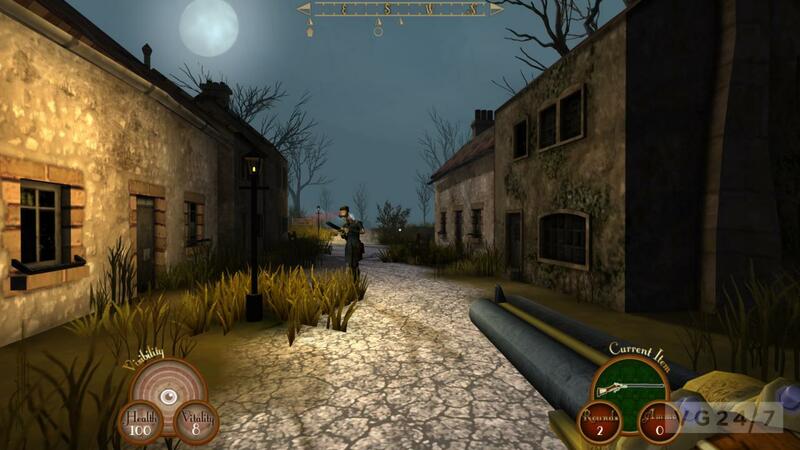 Jolly good sport Stace Harman spends several hours being hunted through the British countryside in the alpha build of Big Robot’s tweedpunk stealth and survival title. 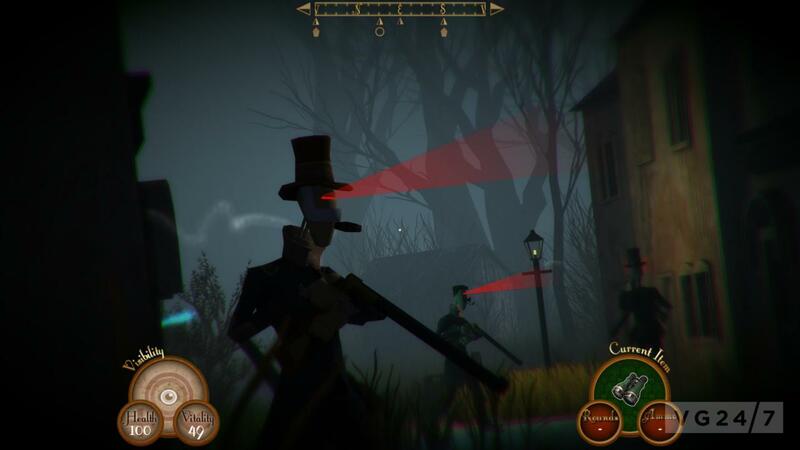 Sir, You Are Being Hunted is being developed for Windows, OSX and Linux by Big Robot; an indie outfit led by Rock, Paper, Shotgun’s Jim Rossignol. It won Game of the Show at this year’s Rezzed expo. In a small but neat touch, changing the gender of your unseen avatar makes the game Madam, You Are Being Hunted. Last year, Sir raised £92,551, more than doubling its £40,000 Kickstarter target and unlocking a a number of stretch goals in the process, including multiplayer. 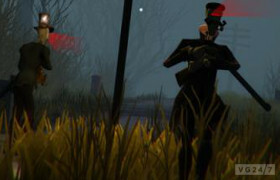 Sir, You Are Being Hunted is expected August 19 for Kickstarter backers, while everyone else can pre-order the game via Big Robot’s website. 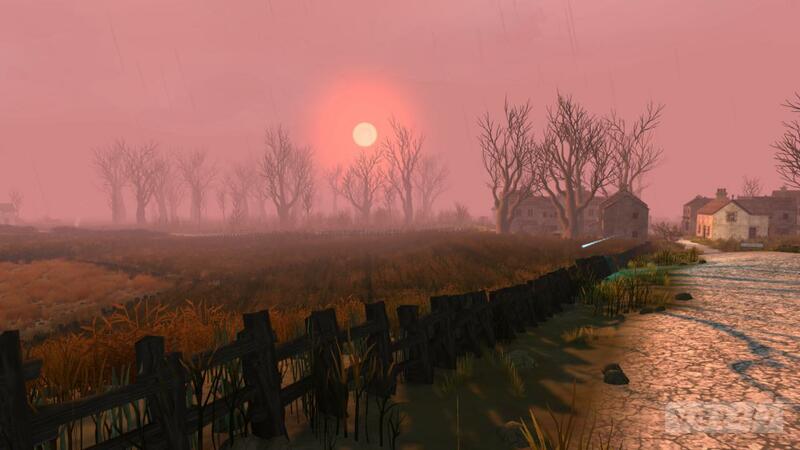 Sir, You Are Being Hunted is a crowd-funded survival FPS being created by indie outfit, Big Robot. This quintessentially British game sees you stranded on a mysterious five-isle-archipelago where the tweed-wearing, pipe-smoking robot gentry hunt you for sport across a procedurally generated rugged landscape. It’s not clear quite how you came to be in your current predicament, but the wry tones of a disembodied butler allude to an experiment gone wrong. Then, without further ado, you’re urged to explore the islands to find pieces of the exploded machine responsible for your transportation, in the hope that reconstructing it will bring you home; wherever home may be. 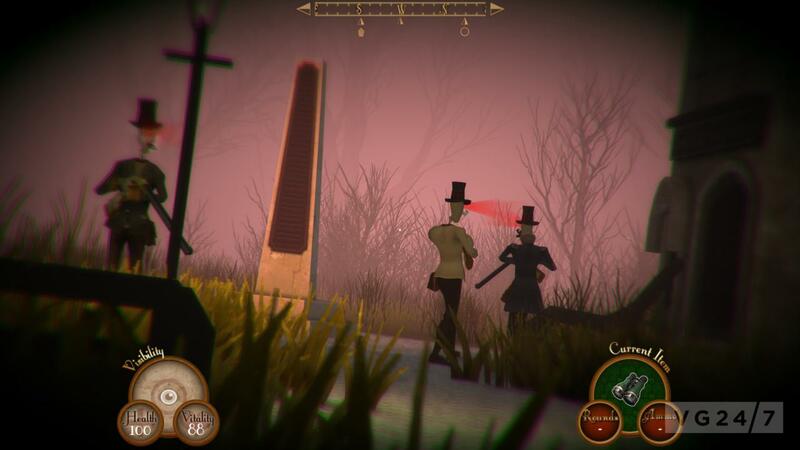 Complicating your quest to return home are a host of shotgun-wielding robots and an ever decreasing vitality meter. For the most part, tackling the former head-on is a fool’s errand and a more considered approach is encouraged. Meanwhile, the inexorable countdown of the latter must be frequently boosted by availing yourself of essential (and oh-so-British) vittles, such as roast hams, whisky, flasks of tea and packets of chocolate biscuits. A separate health counter will decrease if your vitality falls to zero (or if you get shot, obviously) and will only increase if your vitality is sufficiently high. The majority of items are found by looting abandoned buildings, which will often force you into the proximity of the hunters and so necessitate stealth, distraction or, in a pinch, head-on confrontation. Worse still is that as you collect more pieces of the machine the hunt for you intensifies, so where once the robotic gentlemen were happy to break for tea and converse with one another, they later become increasingly set on bagging their quarry. 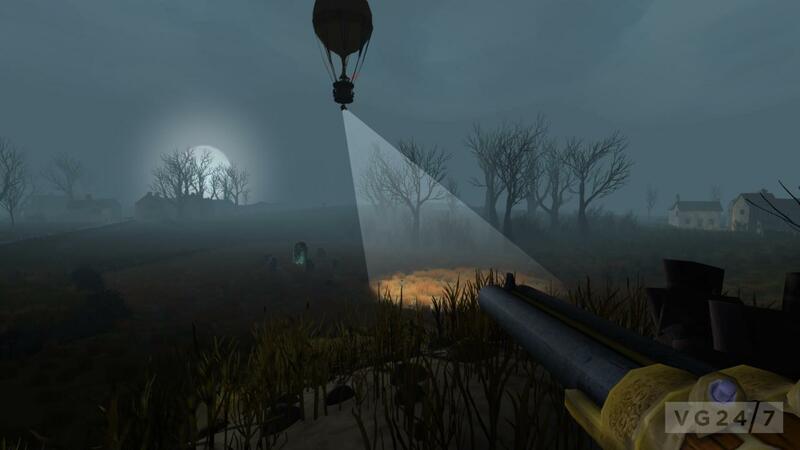 In the current alpha-build, there are two flavours of NPC: the standard hunters, some of whom are accompanied by tenacious robotic dogs, and the hot air balloon scouts that drift silently across the islands and illuminate large swathes of land with a search light. These scouts don’t seem capable of doing you any direct harm but if they catch you in their searchlight they will sound an alarm that brings the hunters running, forcing you to be mindful not only of what’s around you but what’s above you, too. The intention is to introduce other NPCs as Big Robot prepares for the beta release and beyond. These will include placid members of society that will happily leave you be unless they catch you looting buildings; poachers, whose nefarious deeds will ensure they’ll clash with the robot hunters; and the fearsome land-owner, a tyrant who will likely feature late in the game as you get closer to completing your goal. Sir’s loot system is cleverly designed to play on that familiar compulsive need to raid every available container, but the instinctive desire to hoard is kept in check by a number of elegant constraints. Firstly, you only have a limited amount of physical space in your inventory, 5×10 squares to be precise, and different items occupy a different amount of this space. With the multitude of useful items including food, bandages, weapons, ammo, binoculars, matches, traps and machine pieces, which vary in size and shape, your inventory can fill up very quickly. Marry that with trying to loot buildings while the robot menace patrols the land around you and suddenly you’re playing a high-stakes game of inventory Tetris. Not only is it necessary to separate usable loot from junk but it’s also essential to balance what you’re going to need in the short-term with long-term valuables such as the powerful hunting rifle. This is further complicated by there being a finite amount of resources available across the entire archipelago. Items do not respawn and so if you’re gobbling down food and drink to make way for ammo, your may cripple your chances of surviving later in the game when you’re left desperately scrabbling around for something to eat in order to boost your flagging vitality. Mercifully, item storage is persistent, so you can create essential stashes on each of the five islands that will serve as useful pit-stops later in the game. are found in buildings (which cannot be entered and so instead act as giant loot bins) and the appearance of different types of building is controlled by the probability system that lies at the centre of the game’s generative engine. The likes of churches, pubs and manor houses have a higher probability of spawning better loot, but the buildings themselves have a lower probability of being created in the first place. This balance is the key element of the entire experience because while the size of each of the five islands remains fixed their features are randomly generated at the start of each game. This use of procedural generation allows Big Robot’s small team to create limitless island permutations but it’s not without its challenges. Many such challenges concern balance and coherence, as Big Robot’s Tom Betts explained. “Procedural generation isn’t a quick fix,” warns the project’s lead programmer when I caught up with him at PC expo Rezzed. “It’s very easy to use procedural generation to produce a lot of content but you need to spend the time fine tuning it to ensure that content is interesting. “A lot of it comes down to controlling the probabilities of things. The way the world is set up there’s an underlying island that has different variations of terrain and on top of that you can select the sort of region you want. So, you can say I’d like this island to have a high chance of having forests on it and a low chance of having roads. After playing Sir’s alpha build for several hours, I’m impressed by how well struck the overall balance of the game is. While the landscape is varied and diverse, it’s the loot system where the delicate balance is most keenly felt and finding rarer items provokes an internal struggle of what to take and what to leave behind. Worse, though, is occasionally finding a couple of unguarded machine pieces, which throws me into a tizz as I weigh up stashing the majority of my inventory to accommodate both parts with risking the robots posting guards around it if I come back later. Similarly, while it’s quietly satisfying to stealthily divide and conquer hunters that are guarding valuable buildings or machine pieces, the procurement of a rare stick of dynamite affords a moment of gleeful carnage as I take out an entire patrol. 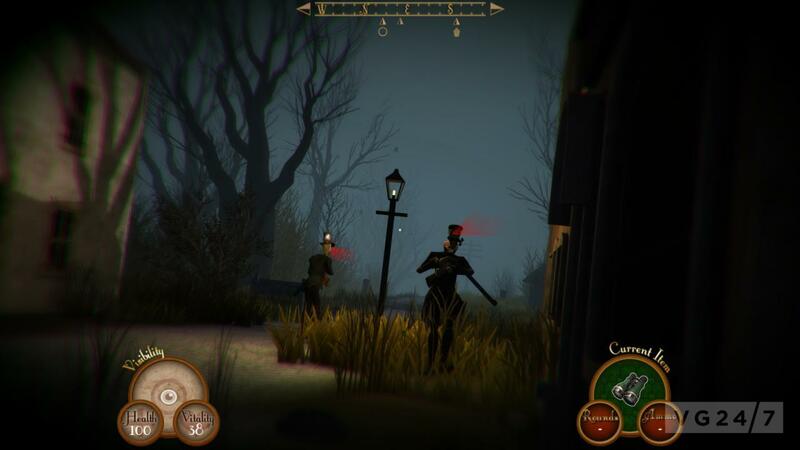 There’s still an awful lot to be added to Sir, You Are Being Hunted but the basic structure is both sound and enjoyable, which makes it one to keep a monocled eye on over the next few months as it gears-up for a full release. 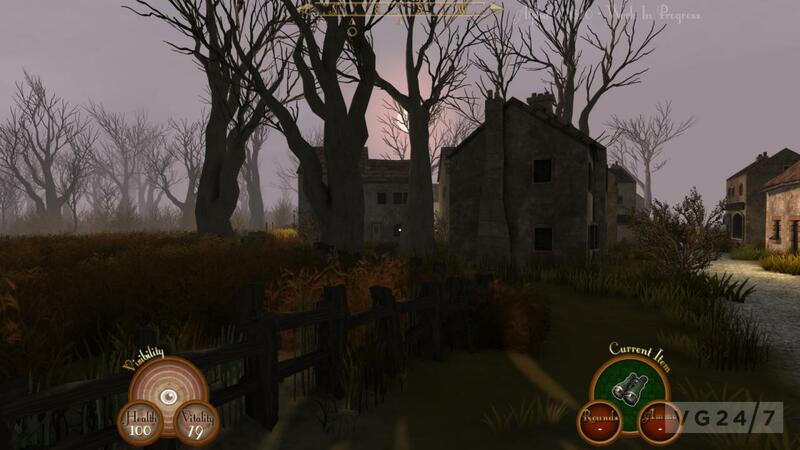 Sir, You Are Being Hunted’s beta access for Kickstarter backers is due for release to Kickstarter backers on August 19.